Experts fear that road salt is beginning to take a big toll on the waterways in the U.S. and are turning to molasses, beet juice and beer or cheese waste to make the waterways safer. Dumped on highways and tossed in entry ways and on sidewalks, salt for many decades has been the cheapest and the most effective way of lowering traffic accidents and falls by pedestrians during winters. However, researchers have cited mounting evidence that sodium chloride crystals in the range of 20 million nationwide annually are increasing salinity of hundreds of the country’s lakes especially across the Midwest and into the Northeast. That puts everything from frogs to fish and everything in between at risk. Salt is believed to have been used for the first time in New Hampshire during the 1940s and quickly became the most popular agent for de-icing as cities grew, highways were made and motorists expected clear and safe roads. One million truckloads or more per year are sent out during icy times, with the majority in the Midwest and Northeast. However, many local and state agencies are looking into ways of lowering the use of salt due to its impacts on the environment becoming much more apparent. 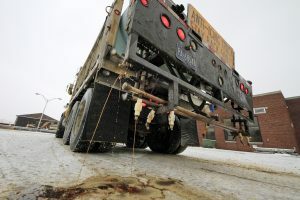 They are turning to equipment that is high-tech to spread the salt in a more efficient manner, better forecasting of the weather to time salting better, and liquefied organic additives, which help the salt to stick to the roadways better. That lowers the salt use through preventing it from being immediately washed away. Agencies from North Dakota to New Jersey have started using mixtures of organic additives that include beet juice, while in Maine and New Hampshire there are towns using molasses. State highway departments have turned to pickle brine, beer waste and in one county of Wisconsin, cheese brine. Salt corrosion is already causing billions of dollars’ worth of damage annually to road, bridges and cars, and now growing evidence shows it is making U.S. freshwater ecosystems saltier. Over the last 50 years, concentrations of chloride in some rivers and lakes have quadrupled and in some, it has increased hundredfold. Researchers have estimated that close to 50 lakes in their study, including ones in Rhode Island, Wisconsin and Minnesota could surpass the chloride threshold of the Environmental Protection Agency for concentration before 2050 and potentially harm aquatic life.